30 Remarkable Spring Porch Decor Ideas Adding Pretty Blooms To The Outdoors! Home » OUTDOOR DECORATIONS » 30 Remarkable Spring Porch Decor Ideas Adding Pretty Blooms To The Outdoors! What’s the complete thing of splendour when it’s spring? Undoubtedly, it’s those gorgeous flowers and fresh greens all around, accompanied by lovely weathers and winds. And this makes us crave to spend a relaxing evening outside the house cherishing the the season at its best. Let’s make that happen with these remarkable spring porch decor ideas! If you have a passion for planting all sorts of pretty flowers and trees around the house, this inspiration for country porch gardening is surely going to delight you. Planting herbs outside the kitchen door and the front porch, while going for lots of rustic things marks the whole setting. You will find so many galvanized and wooden buckets holding plants and other household supplies, natural branches from the yard, some rustic-looking gardening tools, loads of hay in a basket that itself rests on an old worn-out ladder shelf. The herbs outside the kitchen are installed in different types of planters placed inside stacks of wooden crates with distressed paint jobs. Check out the stunning porch decor photographs shared by U Me Lecky in the below guide. Adding all new life to old, used pieces of furniture to whip up brand new things of functionality and decor is always amazing. And this planter made out of two stray drawers is not only spacious and double storey, but also equally chic to look at. The frame holding the drawer planters in place needs just a little woodworking and some wooden boards in sizes specified in this tutorial by Beyond The Picket Fence. The author here grows little sparsely in the planters after making appropriate holes in the bottom for drainage. Stain the boxes with pastel colors that you like, or simply go for a nice Minwax stain to coat the entire structure, and you have got yourself a one-of-a-kind upcycled gardening unit for the porch! 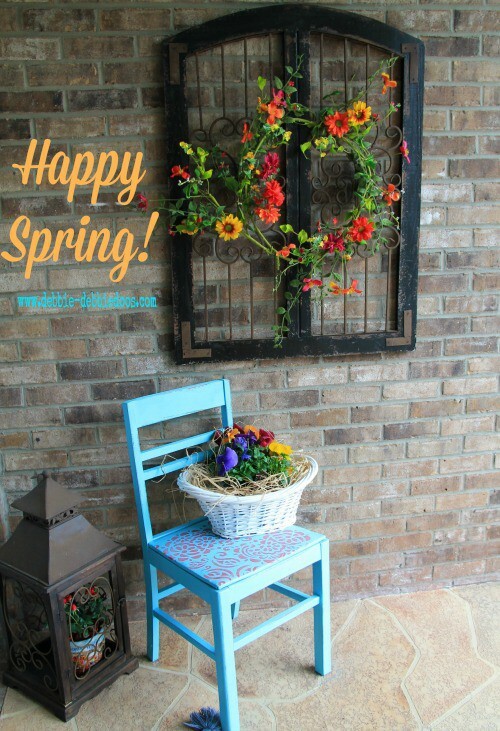 What a vintage-inspired spring porch makeover that features an aqua-color spray painted old chair as its chief element! A beautiful design in a candy apple red color is pulled off atop the chair with the help of a pretty paisley stencil. For the floral touches, the author places a basket full of pansies on the chair, while a large metal frame is used to decorate the wall behind the chair with lots of colorful flowers. You can get as vivid as you want with your choice of extra highlights, such as lanterns, candles, mason jars with plants and more! Take a look at the inspiration shared by Debbie Debbie Doos to learn what all has been done to give the chair the amazing makeover. Spending the whole evening on the porch while cherishing the prettiness of spring will be relaxing than ever. Because you have now come across this gorgeous summer back porch headboard swing is all set to grab a spot there. The homemade headboard swing is brightened up with a lovely shade of blue for the paint job, while a bunch of soft pillows make sure you have all the comfort in the world while you rest outdoors. Once the old headboard is attached to the seat and the armrests, you add the chains for hanging it, finally going for the application of color and adding the throw pillows. Learn the detailed steps of construction as explained in the below guide by The Rustic Pig. Constructing front door wreaths from rustic grapevines is quite a common idea that has been running for ages now. This spring season, get a little out-of-the-box and put those natural grapevines to a new job. Use them to bring out so much more brightness and glow to the front porch by turning them into stunning grapevine orbs. The orbs are put together inside a side table that has got a black wire mesh working as its base and sides, while a wooden round disc works as the table top. The grapevine balls are adorned with pretty string lights to make for the addition of glory. Apart from installing them inside a table, you can also double the balls as a beautiful porch chandy. To learn more about the steps you need to follow, check out the guide by All Things Heart and Home. Speaking of spring decor, most of us think of bright colors and patterns for the planters – but here’s something that shows that black has got its own magic when it comes to adding a contrast to an otherwise colorful setting. These milk can planters coated in deep black all over look wonderful with bright green plants installed inside. And the final touches of beauty are rightly added by a checkered ribbon bow tied around the rim of the planters. You can always customize the planters with a small message or quote, exactly like Tanya writes ‘Welcome’ on the cans using a white chalk. For a denser decor go for a bunch of such planters and your front porch is ready to steal the show. An outdoor bench must be sturdy, durable and chic in terms of appearance, while offering the optimum levels of comfort. But this gorgeous bench has got so much more than these key points. It also comes with lovely planters incorporated on either side of the bench, bringing in a variety of textures and colors together. The modern and airy bench features alternating boards on the planter boxes, signifying summer at its best. The piece by piece assembly of the porch bench is as easy as a piece of cake, and the key to making it cozy is to add some colorful printed cushions to the seating section. How the natural hue of the wood is kept intact in the final piece is amazing, but going for a stain that matches the outdoor decor of your home is equally cool. Is there anything that can beat the classic combination of black and white ever? The answer of course, is No! And that’s exactly what these striped pots with lovely white and black alternating stripes are all about. The chic pots are square-shaped with a tapered bottom that makes the stripe pattern come out even stronger. To work up the pattern, you can take the assistance of some striping tape or duct tape. Once the white paint is done, you can remove the tape and finish the pots with a clear glossy sealer. The author accompanies the striped pot with a graphic pot in the same glorious color combo to work up the perfect accents to the decor. What the title of this inspiration signifies is a super cute message displayed on a lovely chalkboard placed on the front porch. Apart from the custom chalkboard, you have got a whole spectrum of rustic decorations to accomplish the final whistle-worthy look. A large vintage lanterns holds a candle inside, while a wooden pallet box rests on the floor in an inverted fashion to double up as a unique side table. A huge glass jar is used as a vase, housing thin natural branches with white flowers and fresh greens. More lanterns, wood signs that match the mood of spring, and even more planters with different textures and colors add the cherry on the cake here! No more than a deal of 5 dollars is all it takes to get a pair of simple rain boots, subjecting them to a little dose of creativity and pulling off a wonderful front porch decoration. The pair showcased by Twelve Oaks Manor is a sunny bright yellow with a white print going for the accent. The boots in themselves bring so much color to the space, and the addition of flower sprigs to the boots takes the beauty to new heights altogether. Surely, it’s a small change to the setting, but comes with the capability of making a huge difference. A nice welcome mat would go perfect with the rain boots kept around the front door, further placing some more low-height terra cotta pots for the planting of flowers. 20 Ultra Cool and Refreshing Summer Porch Decor Ideas to Welcome the Season in Style! 14 Brilliant Small Outdoor Space Design Ideas that Will Totally Awe-Inspire You!